If the losses of Prince, Carrie Fisher and David Bowie last year, and George Romero and Tom Petty this year have taught us nothing else, it's that we should appreciate our icons — and our loved ones — while we can. So raise your glasses and your chainsaw arms to Bruce Campbell. Celebrate the man and his jawline while he walks among us alive, and not as the epic scene-chewing zombie he'll likely return as. After all, Campbell, with more than 100 film credits to his name, was lopping the heads off zombies when Daryl from The Walking Dead was still, you know, clean. Join fellow undead heads on Friday, Oct. 13 (of course) at 7:30 p.m. for the Frightful Friday Flix Bruce Campbell double feature of Army of Darkness (1992) and Bubba Ho-Tep (2002) at the Eureka Theater ($5). 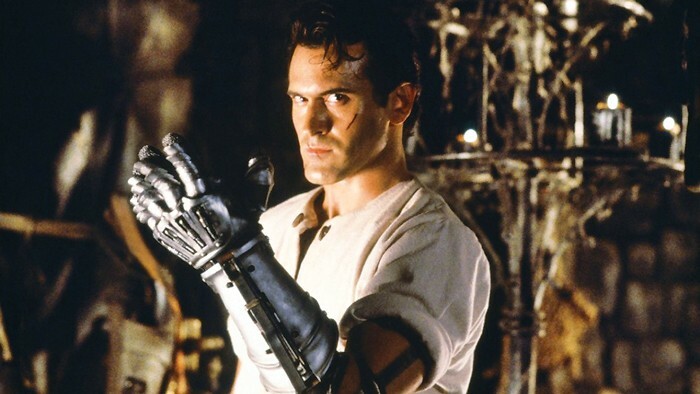 Following Sam Raimi's Evil Dead and Evil Dead 2, Army of Darkness finds our hero Ash transported to medieval times, where casts spells and wields his "boom stick" against a necromancing witch and hordes of Deadites. Refill your popcorn and hop right back in your seat for Bubba, in which we find out what really happened to Elvis: He's living in a rest home and throwing down against an Egyptian monster with another senior who thinks he's JFK (Ossie Davis). Kind of a gimme when you think about it.